Easy Sugar Cookies for All Year Round! Nothing says year-round holiday fun like baking easy sugar cookies and decorating them with family and friends. Christmas, Valentine’s Day, Easter, even the Fourth of July, this is the best sugar cookie recipe around! The best cookie recipes are simple, timeless and fun to make! 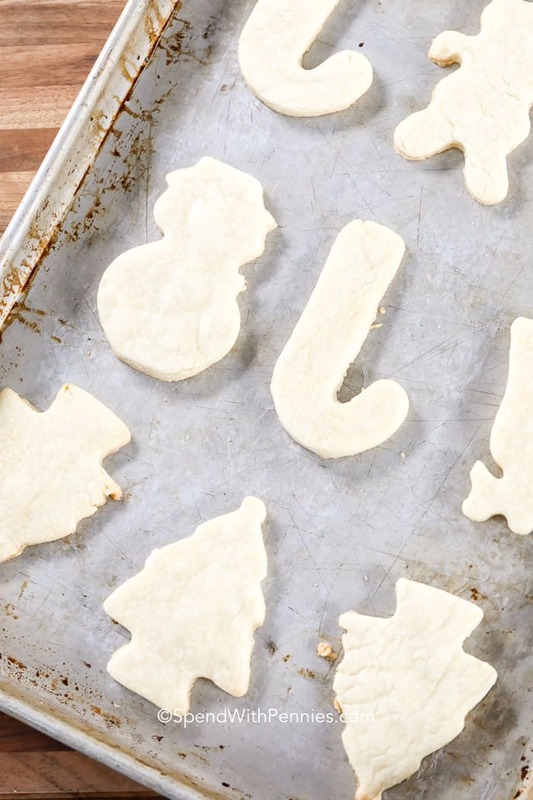 This easy sugar cookie recipe is short on ingredients but long on the dozens of ways they can be shaped, stamped, sliced, or decorated! Eggnog Cookies – mmm, eggnog! Perfect Chocolate Chip Cookies – totally perfect! Candy Cane Cookies – adorable and festive! Really, really good sugar cookies are ones that are uniformly mixed, shaped and baked. Be sure to have quality baking pans and a properly calibrated oven so the cookies bake evenly. 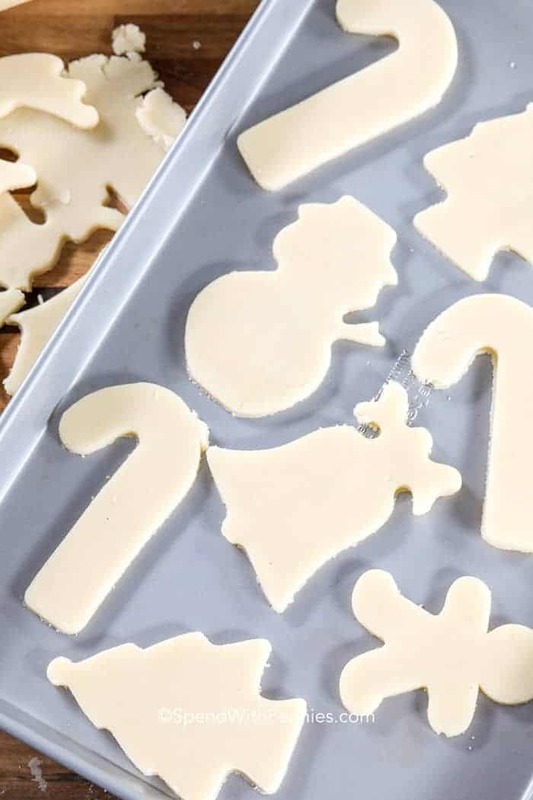 Sugar cookies are white and look best when they are not brown, burnt or discolored on the edges, so the use of quality bakeware, or using parchment paper is key. Chilling the sugar cookies allows for the butter to firm up a bit which will keep the cookies from spreading too much and looking flat. Plan to chill the sugar cookie dough in order to produce the best result. You won’t be disappointed because a soft sugar cookie recipe is worth learning to perfect and you’ll use it all year long! These little gems are perfect on their own, but for decorating, the best sugar cookie icing always starts with powdered sugar! Made with milk, and or corn syrup make it easy to tint with food coloring and easy to smooth on! Sugar cookie frosting is basically the same thing, just thicker and more of a spread than an icing. Either method can be tinted with food coloring. Sugar cookies are one of the most popular cookie recipes for decorating. 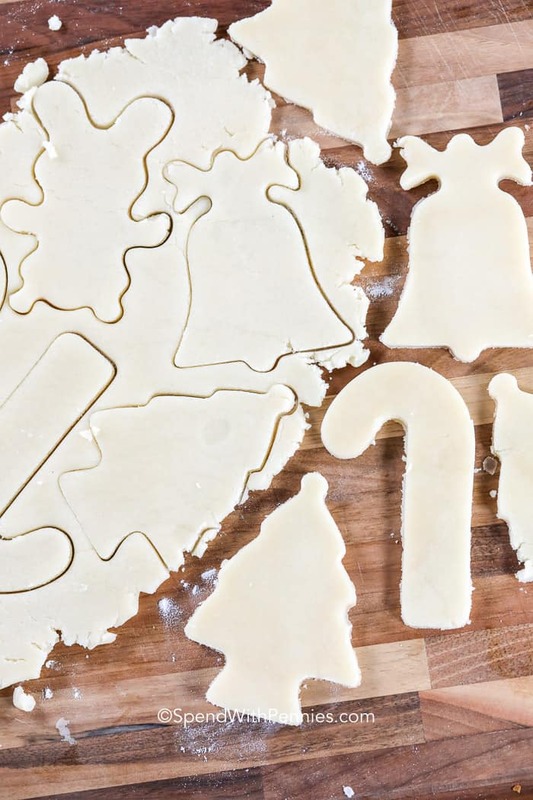 Feel free to have fun with cookie cutters, stamped rolling pins or simply free form them by hand – sugar cookies are the best way to spend a day in the kitchen! 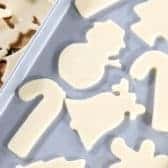 To make Christmas sugar cookies, or any time of year cut out cookies, roll dough out evenly on a lightly floured surface and cut or stamp out desired shapes. Carefully transfer to a greased cookie sheet (or non-greased, but covered in parchment paper), and proceed to embellish with nonpareils, dragees, or colored sugar. Once cookies are completely cooled, decorate with tinted icing or frosting and embellishments. This is why everyone loves to bake sugar cookies! 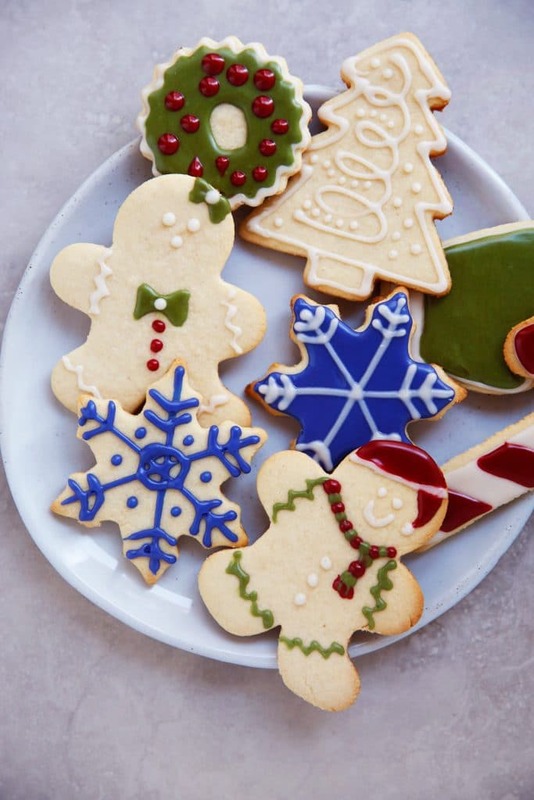 Nothing says year-round holiday fun like baking easy sugar cookies and decorating them with family and friends. Combine butter and sugar in a bowl and mix on medium until creamy. Add flour mixture a little bit at a time, mixing with a wooden spoon until incorporated. Cover dough and chill 4 hours or overnight. Roll dough to 1/4″ thickness and cut into desired shapes. 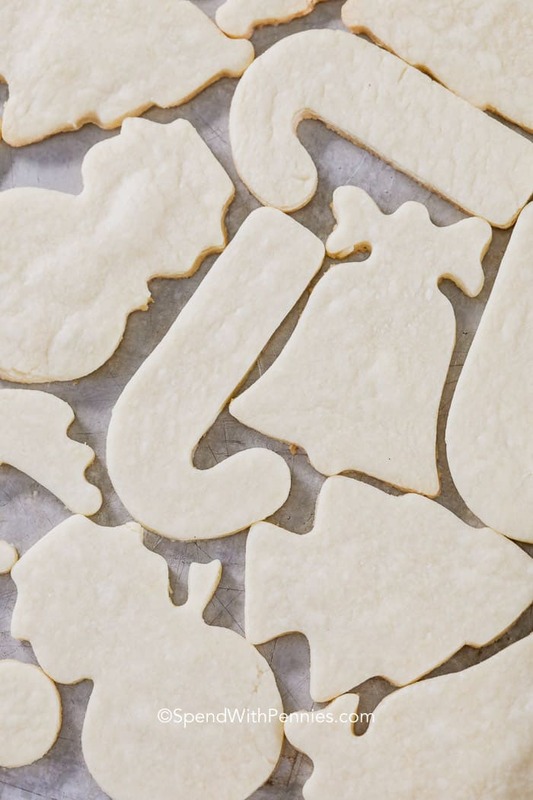 Place cookies 1″ apart on an ungreased cookie sheet and bake 9-11 minutes. 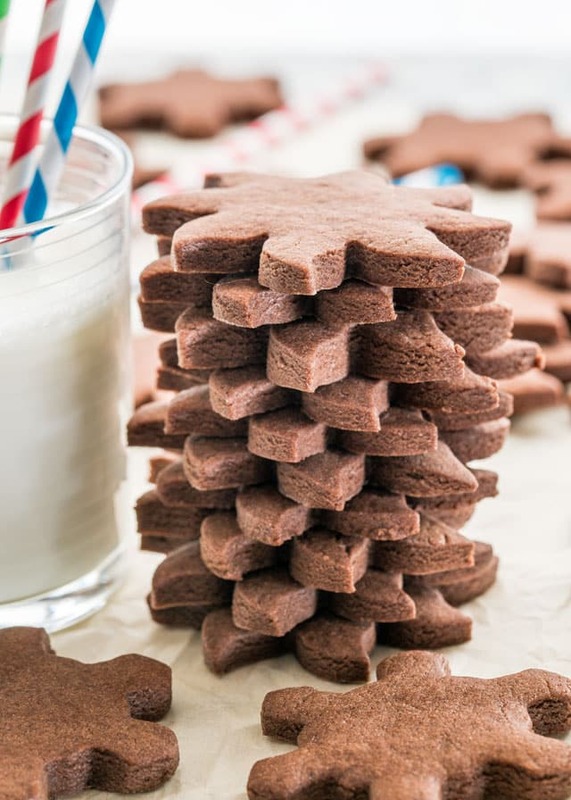 The post Gluten Free Cut Out Cookies appeared first on Lexi's Clean Kitchen. This list includes the foods I eat on a weekly basis and which brands I choose. 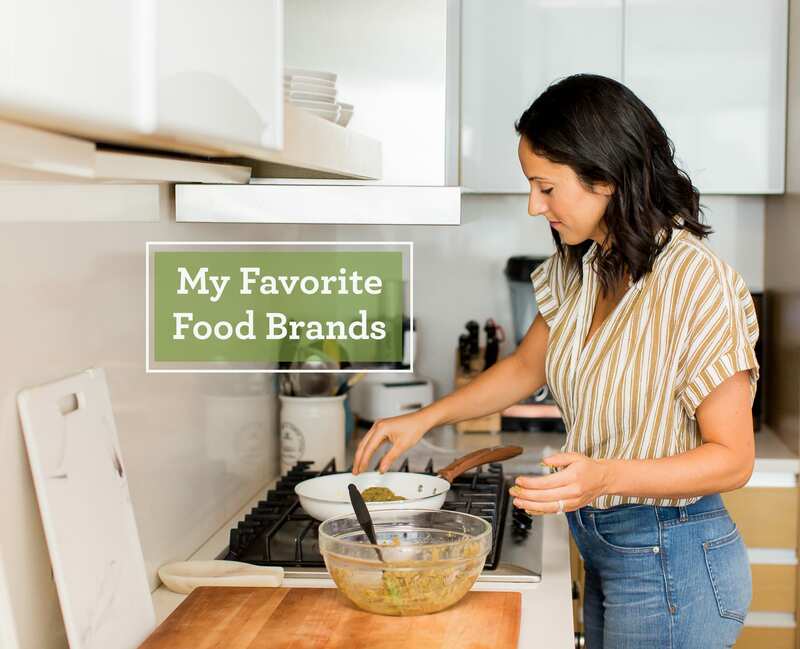 From yogurt to bacon, I’m sharing which brands of foods I keep in my pantry, fridge, and freezer. The post My Favorite Food Brands appeared first on Inspiralized. 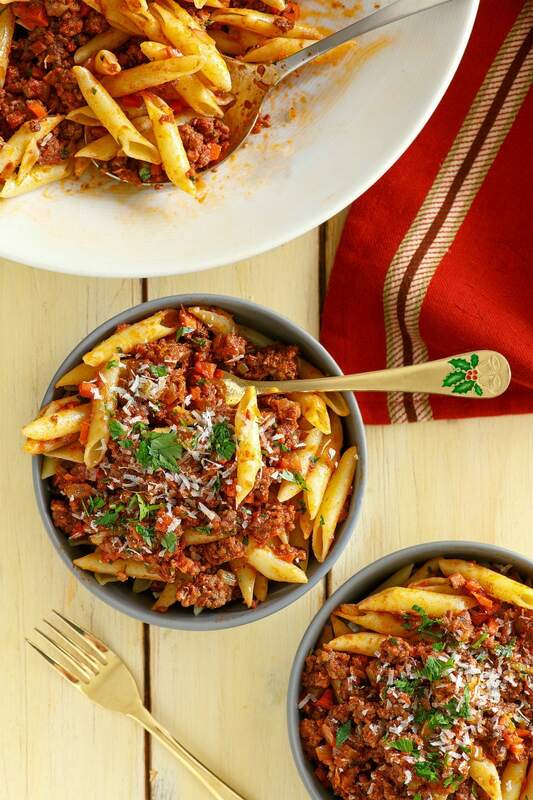 This Christmas Pasta recipe is perfect for the holidays because it feeds a large crowd. This recipe, originally created by Rachael Ray, serves two purposes. It’s pretty as a Christmas Pasta because of the red sauce and the green parsley garnish. And it’s a nice recipe for the holidays because there are usually quite a few people around, and this recipe makes enough to serve twelve people. If you don’t have twelve people hanging around at the same time, that’s okay! Make the sauce recipe, and then make half of the pasta (16-ounces). The flavor of the pasta sauce totally improves the longer it sits. So if you serve some up one day and then finish it up a couple days later, that’s a good thing! You can also freeze half of the sauce if you don’t want to eat it all within a week’s time. Store extra sauce for this Christmas Pasta it in a freezer-safe container. Try to use it up within a couple of months. When ready to use, let it defrost in your refrigerator overnight. Then cook up some pasta, and use up the rest of your sauce. What kinds of meats are in the sauce for Christmas Pasta? 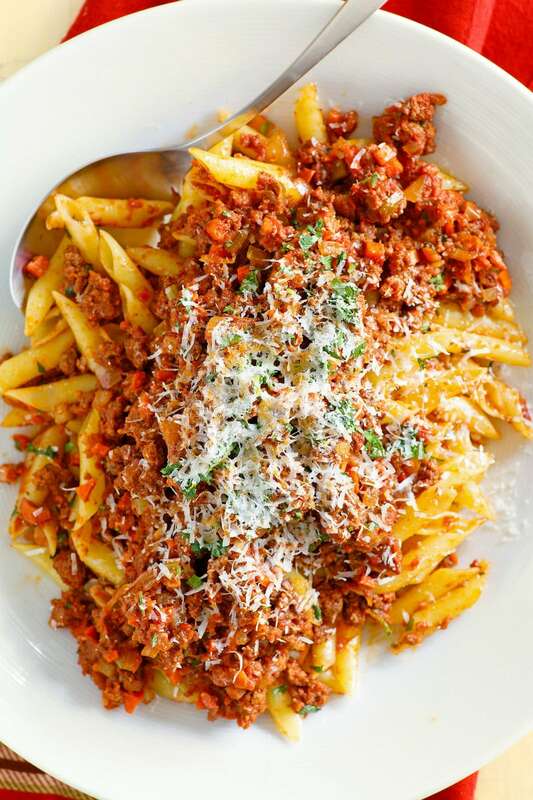 The sauce recipe for this pasta is a hearty meat sauce. The recipe for the sauce begins with cooking some pancetta in a skillet. Pancetta is cured pork belly (similar to bacon, except bacon is smoked after it’s cured). A lot of people mistake prosciutto for pancetta, but prosciutto is cured ham and it doesn’t have to be cooked before it is eaten. Pancetta (what is needed for this recipe) can usually be found near the prosciutto in a little package- and it’s usually already cubed. If you can’t locate it, ask the person at the deli. They might have it there. 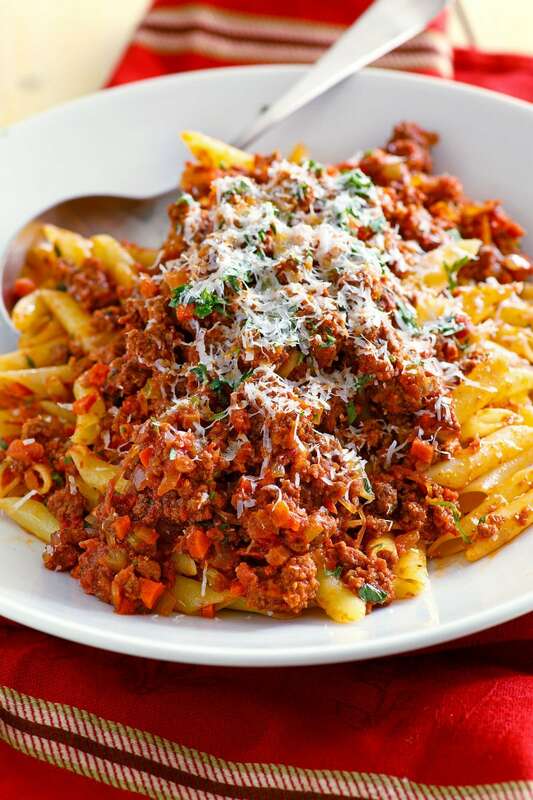 This Christmas Pasta sauce also calls for both ground beef and ground pork. Usually you can buy both of these in a package of 16 ounces or so at your regular market. Since you only need 8-ounces of each, I suggest going to a market where they sell it by the pound. I know Whole Foods does this. Others probably do too. Or just buy 16-ounces of each, use half of each, and plan to freeze the rest for later. And finally, there’s some Italian sausage in the recipe too. You can use sweet Italian sausage, or you can spice things up a little and use hot Italian sausage. What kinds of pasta would be good for this recipe? 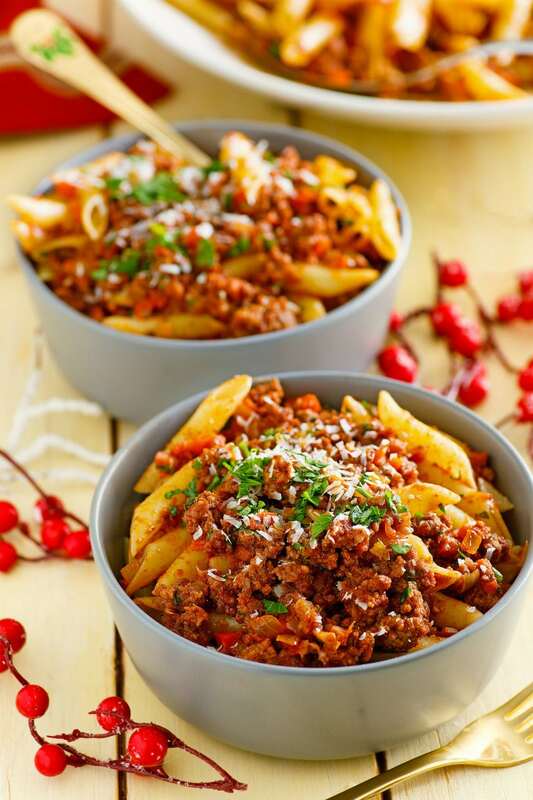 This Christmas Pasta recipe calls for penne pasta, but there are certainly other varieties of pasta that are good for pairing with a meat sauce like this one. If you want to try using another variety, I recommend using medium shells, campanelle, rigatoni, or orecchiette. Pappardelle (wide egg noodle pasta) is great for topping with meat sauce too, but it’s an entirely different kind of pasta than penne! I love to make this pasta during the holidays because of the wonderful sauce. There are so many people in and out of my house during the holiday season that it is awesome to know I have something good to feed them when people show up unexpectedly. We usually make some sort of fancy dinner on Christmas Eve, and we do something low-key (like pasta) on Christmas night. This recipe is perfect for that. It’s a nice recipe to use all year long too. My son (teenager) often brings friends over, and they’re inevitably starving. I can just boil some pasta and scoop a little sauce on top, and I’ve succeeded in feeding hungry boys! If you’re looking for more festive things to serve for the holidays, you might like to try my Spinach and Cheese Stuffed Manicotti or this Coq au Zin. One Pot Paprika Chicken Thighs, Garlic- Rosemary Chicken with Cranberries and Prime Rib Roast with Red Wine au Jus are delicious choices too. This pasta recipe is festive enough for the holidays, and it feeds a lot of people! Heat a large pot over medium-high heat. Add the pancetta and brown to render the fat. Transfer the pancetta to paper towels to drain. Add the oil to the pan, and then the meats and brown and crumble them for 5 minutes. Stir in the garlic, and pancetta bits. Chop the carrot, celery, and onions near the stove and add to the pot as you work. Cook the vegetables with the meat for 5 minutes and then add the wine. Cook for 1 minute; add the broth and tomatoes to the pot. Stir in the parsley, allspice, or cinnamon and season the sauce with salt and pepper, to taste. Bring the sauce to a boil, reduce the heat to medium low, and cook 10 to 15 minutes, minimum, before serving. Reheated sauce only improves. Toss the pasta (cook off only as much pasta as you need at the time: half a pound for every 3 people) with a couple of ladles of sauce to coat, then top the bowl with extra sauce. Top the pasta with lots of cheese, as desired. Parmesan cheese is not included in the nutritional information. 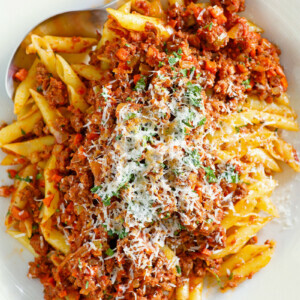 The post Christmas Pasta appeared first on Recipe Girl®. The post Double Dark Chocolate Muddy Buddies appeared first on What's Gaby Cooking. 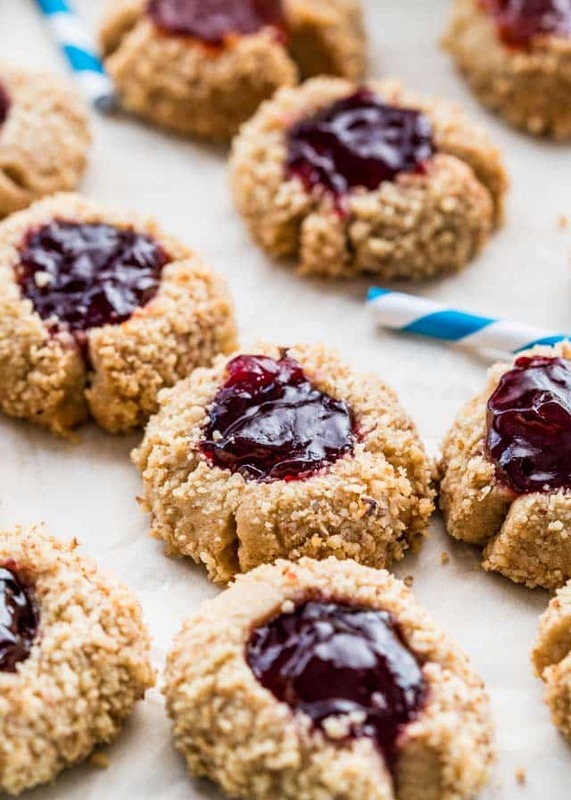 The post Thumbprint Cookies appeared first on Jo Cooks. The post Chocolate Sugar Cookies appeared first on Jo Cooks. 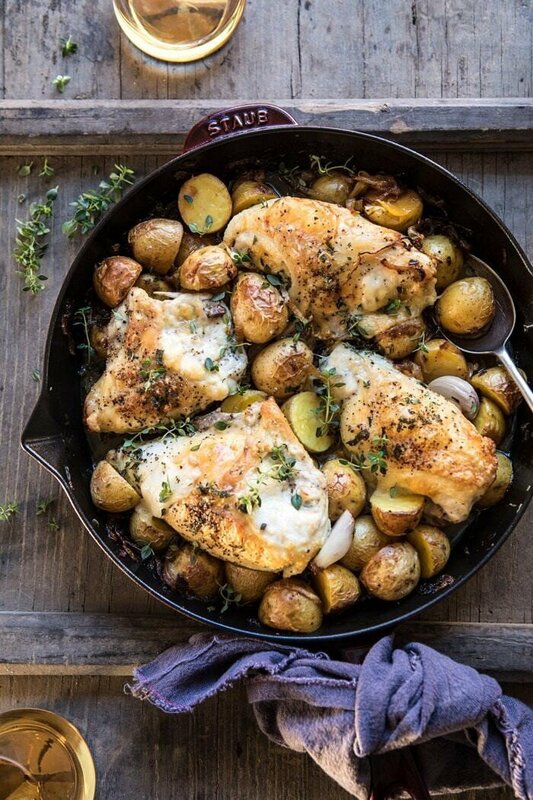 The post Skillet Roasted French Onion Chicken and Potatoes. appeared first on Half Baked Harvest. Ham and Cheese Croissant Casserole Recipe – An easy and delicious breakfast casserole that everyone loves! Made of ham, two cheeses, and buttery croissants and baked to perfection! Are you looking for an easy and elegant breakfast casserole that is perfect for serving for breakfast throughout the holidays or for Sunday brunch? This easy Ham and Cheese Croissant Casserole elevates that old standard breakfast casserole recipe to one that everyone always raves over when I serve it! It makes a perfect make ahead breakfast recipe that makes entertaining even easier! 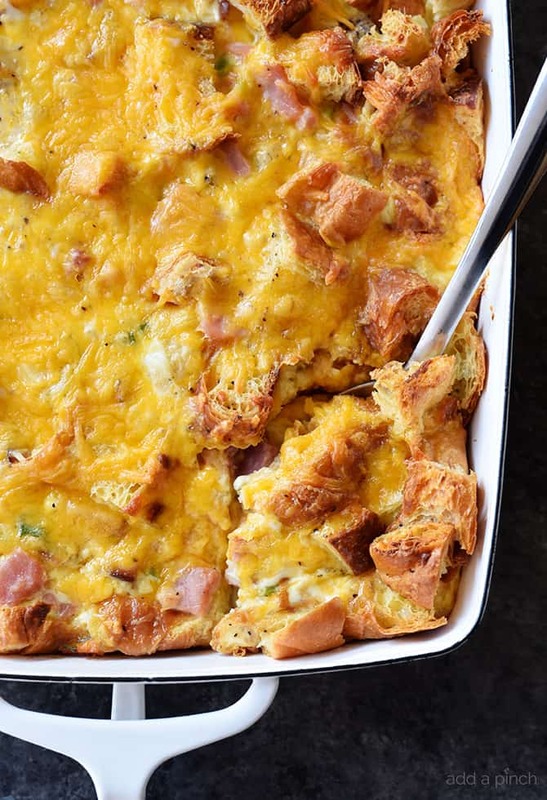 The post Ham and Cheese Croissant Casserole Recipe appeared first on Add a Pinch.